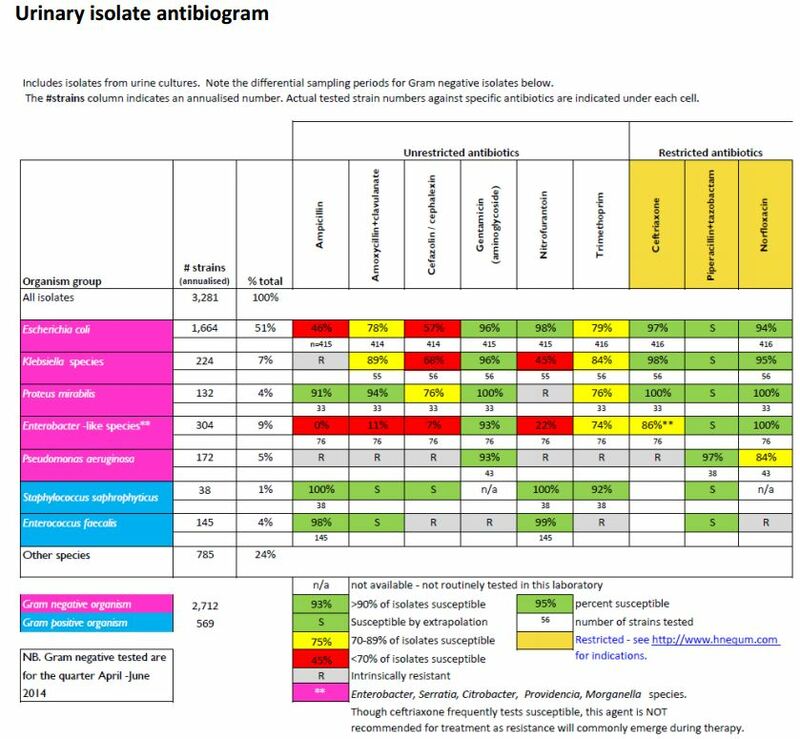 Antibiograms provide data on the collective susceptibility of major pathogens across relevant types of antibiotic, usually stratified by specimen source (urine, non-urine or bloodstream). See an example table below configured according to the Australian recommended format. Under Australian recommendations, they also include information about local occurrences of sentinel pathogens such as MRSA, VRE, MRGN (ESBL and CRE) and penicillin -resistant pneumococci. In Hunter New England, we stratify these by healthcare status, detailing community-associated isolates separately. Commentaries that interpret the local antibiogram against national therapeutic guideline recommendations are important to include if the antibiograms are to be shared with clinicians. Antibiograms hospitals inform local empirical therapy, guidelines and assist with formulary management. The technical aspects of their production are well described in the relevant CLSI standard and also within the Commission document referenced below. General Australian antibiograms are available in the Australian Medicines Handbook. Local antibiograms for HNE Local Health District are available through Pathology North via this Blog. For more information on antibiograms, including how to produce your own see the Australian Commission on Safety and Quality in Healthcare.